Have you always wanted to have a better indoor/outdoor flow to your home, well now you can with French Doors from Markwell! Based in Bishops Stortford, Hertfordshire, we have a wide variety available that can lift the style of your home giving it a more continental look and at the same time allowing more sunlight and ventilation into your home. French doors have the ability to create a feeling of openness to an area as they can fold inwards or outward depending on the space requirements of your home. As with all of our products, they are constructed from top quality materials and we can custom size them to suit your home and door opening. At Markwell, you will be spoilt for choice. We have a huge variety available in terms of colour, style and finish, so you’re sure to find the one that’s just perfect for your home and as they come complete with great looking hardware you can ensure they fit in with the aesthetics of the rest of your home. French doors not only create a feeling of openness, they bring in more light, make a room look bigger than it actually is and add beauty and style to your home. You can easily move between your garden, the patio and the indoors as they have an inviting feel to them. 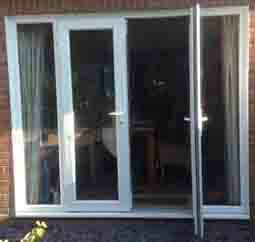 Markwell supplies and installs PVCu Aluminium and timber French Doors. If you are interested in finding out more about French doors please call or send us an email and we will be more than happy to help you out. If you are in the Hertfordshire or Essex area, you can also drop into our showroom and take a look at our products on display.